Formula 1 drivers have threatened to boycott Sunday's German Grand Prix if there is a repeat of the tyre failures experienced at Silverstone. The Grand Prix Drivers' Association, which represents the vast majority of drivers, said its members wanted to express their "deepest concerns". The GPDA added: "If similar problems manifest themselves at the German GP, we shall immediately withdraw." 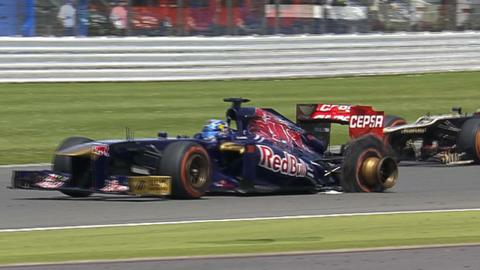 Six drivers suffered failures during the British Grand Prix last weekend. Should there be further problems in Friday's practice or qualifying on Saturday, it is understood the drivers will hold further discussions and one option will be to boycott Sunday's race. Mercedes' Lewis Hamilton, Ferrari drivers Felipe Massa and Fernando Alonso, Toro Rosso's Jean-Eric Vergne, Sauber's Esteban Gutierrez and McLaren's Sergio Perez were all affected. The GPDA statement said: "We trust that the changes made to the tyres will have the desired results and that similar problems will not occur during the German GP weekend." Red Bull driver Mark Webber said: "Actions speak louder than words and Pirelli has to do something from a safety perspective. "Performance is one thing but when you have safety involved, you have to find the right way for all of us. The statement put out by the Grand Prix Drivers' Association on Thursday said the drivers - or at least those in the GPDA - would 'immediately withdraw' from the event if there were 'similar problems' to the tyre failures seen at Silverstone. The question is what exactly does that mean? It certainly leaves lots of wriggle room. From talking to senior drivers, it certainly does not mean that if there is one puncture they will all simply get out of their cars. The likelihood is they would finish the session they were in, try to find out what happened and then discuss it. Because obviously racing tyres can fail, however robust they are. That can never be ruled out. It's also worth saying that the drivers do not expect there to be any problems at this track - but they are seriously concerned about tracks such as Spa in Belgium and Suzuka in Japan, and are pleased Pirelli is planning to change the tyres fundamentally after this race. "Silverstone was a very dramatic and extremely unsafe scenario for all of us." Marussia chief executive Graeme Lowdon says the concern of the drivers is shared by the teams themselves. He told BBC Radio 5 live: "I have sympathy with the feelings of the drivers because they are at the sharp end. You can understand why feelings are running very high. "But equally we as a team would not put our drivers in a position which is unsafe. I think there are more people than the drivers looking at this. "I think anything involving the drivers would also involve the teams. We are extremely concerned with safety." Earlier on Thursday, Alonso described the experience of being right behind Perez when the Mexican's tyre failed. The Spaniard, who was travelling at 179mph, said: "It was a dangerous situation. "I committed to overtake Sergio on the left. I was lucky because maybe if I chose the right, everything would hit my helmet. "There are pieces of steel coming at 300kph (186mph) so it would be like a bullet or a knife." He added: "Pirelli made some changes. We trust them. We think they solve the problem." The GPDA is chaired by Pedro de la Rosa, with Sebastian Vettel and Jenson Button as directors, but Lotus driver Kimi Raikkonen, Force India's Adrian Sutil and Williams' Valtteri Bottas are not members. Bottas said on Friday: "I will be racing." The GPDA has been concerned for some time about the number of tyre failures this season. In the early races there were a series of delaminations. This is where the tread separates from the tyre but it stays inflated. After this, the GPDA asked Formula 1's governing body, the FIA, for reassurance that changes would be made. Ahead of last month's Canadian Grand Prix Pirelli wanted to introduce new tyres but this was blocked by three teams who felt the move might harm their competitiveness. These same tyres will now be used in Germany. Pirelli refused to say at the time that there was a safety issue, and the rules dictate that tyres can only be changed for other reasons during a season with unanimous approval of the teams. But following the problems at Silverstone, which all agreed were unacceptable, the FIA has stepped in and forced through a change, which all teams now accept was necessary. Pirelli issued a statement on Tuesday blaming the failures on teams not running the tyres according to its guidelines. But Button said: "We followed all of Pirelli's guidelines - on both cars."